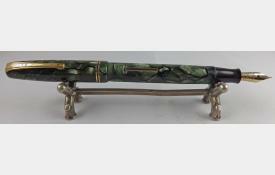 This Burnham No 55 fountain pen, in green with black veins is in splendid condition. 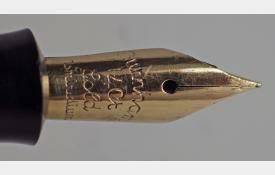 Unusually for Burnhams of this date, the gold plating is very good, showing wear only on the tip of the clip. There are no cracks, scratches or bite marks. 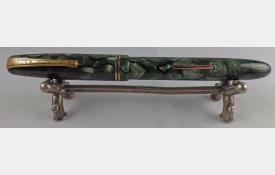 The pen closes firmly with two turns. The barrel imprint is clear. 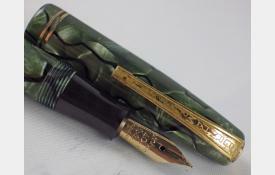 A new sac has been fitted and the pen fills and writes well (see writing sample). 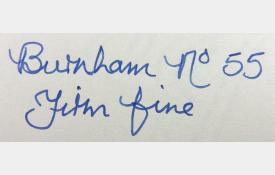 The 14 carat gold Burnham nib is a firm fine. 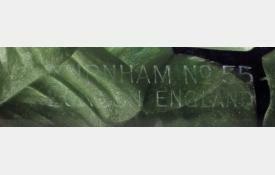 You don't find many Burnhams it is good condition as this one. A superb pen and an excellent writer.